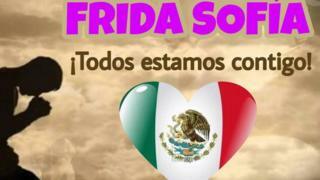 Image caption 'Frida Sofia: We are all with you'. "She is called Frida Sofia and she is twelve years old," tweeted star journalist Joaquin Lopez-Doriga from the site of a collapsed school in Mexico City. 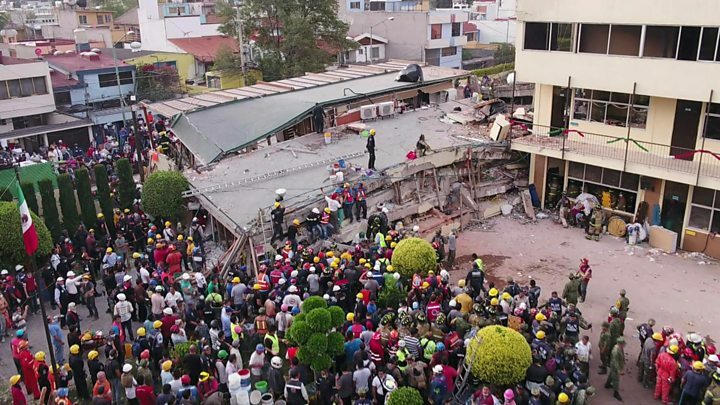 As the race to find survivors in the rubble of Enrique Rébsamen school enters its third day, Mexicans and the world have become captivated by the rescue of a girl they are calling 'Frida Sofia', believed to be one of several children sheltering under a table. Hope that the children will be recovered alive, expressed in the hashtag Frida Sofia, was trending worldwide by Thursday morning with almost 200,000 tweets sent about the trapped children. Whether one of the trapped children includes a child called Frida Sofia is currently unclear. Mexican newspaper El Universal is reporting that, according to the school, there is no child on the school register called Frida Sofia. At least 21 children and five adults died when the primary school, in Mexico City's southern Coapa district, collapsed after a 7.1 magnitude earthquake struck. So far 230 people in the country have known to have died. Anxious parents and onlookers gathered by the collapsed school, when a rescue worker using thermal scanning detected survivors between the concrete slabs. "They are alive! Alive!" he shouted. "Little Frida Sofia has survived 32 hours trapped under the rubble, fighting for her life. A real fighter, soon she will be out of it," wrote Mexican YouTuber Ryan Hoffman, in a tweet shared almost 5,000 times. "Retweet if you're not going to sleep until you see Frida Sofia out of the rubble," another social media user @Nota_Bautister wrote. "Frida Sofia...they told her to move a hand, she moved a nation," @LorsRuizVelsaco wrote, commenting on reports from journalists at the scene that rescue workers asked the trapped children to move their hands to show they were alive. Cartoons and pictures are also being shared online, including one showing Mexicans and the Angel of Independence, which is a prominent statue in Mexico City, united in a human chain. Rumours about a successful rescue of Frida Sofia also spread through Twitter, only to be corrected by journalists who confirmed that the children were indeed still trapped. "Unfortunately the rumour that little Frida Sofia has been rescue from school Enrique Rébsamen is totally false," Mr Lopez-Doriga tweeted late on Wednesday night. The third storey of the damaged school building where rescue workers are working is also thought to have collapsed.